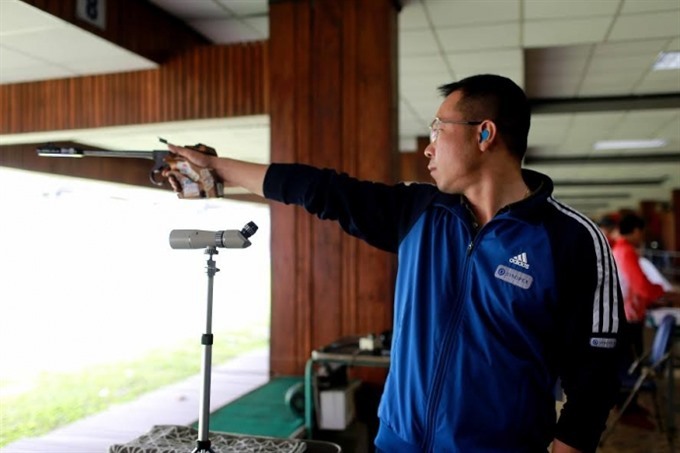 HÀ NỘI — Hoàng Xuân Vinh has won two gold medals at the ongoing National Shooting Cup in Hà Nội. It is his first domestic event since his magical victory at the Rio Games last August. Vinh took the lead in the men’s 50m pistol with 655.1 points, followed by Nguyễn Hoàng Phương with 639.9 points and Trần Quốc Cường with 631.1 points. In the men’s team 50m pistol event, Vinh and his teammates Phương and Vũ Tuấn Dương also won gold. On Saturday, Vinh will compete in the 10m air pistol event. According to coach Nguyễn Thị Nhung, the tournament is a warm-up for the Olympian gold medalist Vinh to prepare for the upcoming Southeast Asian Games, to be held in Malaysia in August.